PDEC (Personal Data Ecosystem Consortium) is a not-for-profit trade association with members around the world. We exist to activate and broaden the Personal Data Ecosystem. An Ecosystem that centers on people and their data, that enables organisations to make person-centered data logistics a reality. ❶ Protecting People and their rights – empowerment, personal control over personal data and identity and transparency about where and how it is used. reaching agreement on shared challenges and ensuring transparency and accountability regarding data that they retain, transmit or exchange about people. ❸ Interoperability across open diverse ecosystems with diverse business models. ❹ The creation of successful business models to deliver return on investment justifications and monetization strategies for companies operating in the personal data ecosystem. 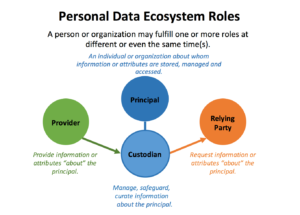 Providers – Those organizations who generate, validate, create, or certify information or attributes relating to principals that other roles within the ecosystem may wish to collect, protect, curate, or access and make use of. Custodian – Those organizations that are not interested in the actual information itself but rather provide services and solutions for the secure collection, transmission, exchange, storage, curation, management of the data on behalf principals. In general, it is by the explicit delegation of a principal that a custodian is empowered to operate on their behalf. Relying Party – An organization, service or solution that requests, consumes or relies on data from others about or related to principals.